The Sport Orthotics team based in The Treatment Hub clinic in Hamilton near Glasgow have been involved in the assessment and manufacture of Ankle foot orthotics (AFO's) for almost 20 years. Our Specialist Orthotists are involved in Specialist foot and ankle clinics with Consultant Orthopaedic Surgeons, Podiatrists and Physiotherapists. We even have specialist neurological clinical experience on both Adult neurological clinics and specialist Paediatric orthotics. Ankle foot orthotics (or orthoses) are very specifically designed for conditions that require increased control and support other than just the foot. 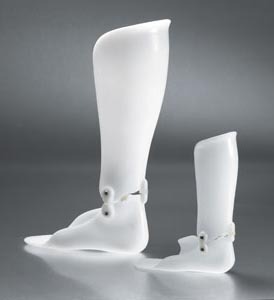 The height of these particular orthotics allow increased control over the ankle, knee and hip. AFO's do this by changing the biomechanics of the leg and facilitating a normal biomechanics walking pattern. A key part of providing Ankle foot orthotics (AFO's) is the biomechanical assessment. Patients with neurological conditions require a specialist neurobiomechanical assessment. There are only a very few private biomechanics clinics that have access to experts in this area. Our clinic in Hamilton, near Glasgow is one of only a few in the country with this specialist knowledge. These orthotics are preferably custom made for each individual patient to ensure that they are optimally aligned to maximise their fit and biomechanical effect. Our private orthotics clinic near Glasgow frequently treats patients with biomechanical issues requiring this type of orthotic treatment. What problems can AFO's help?